Breathable fleece electronic blanket to give you utmost comfort. 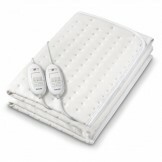 This blanket makes you feel cozy and has 6 temperature settings for your convenience. It is made of fleece and is perfect to use in harsh winter conditions or on those shivery days. Product is machine washable at 30°C only. Offering the Beurer Blanket Machine Washable Machine Double Electric TS 26 XXL with fast shipping in Karachi, Lahore, Islamabad, Rawalpindi, Peshawar, Quetta and many other cities of Pakistan.